The summer of 1992 was the turning point for Barcelona. In preparation for the Olympic Games, the Catalan capital was totally transformed into what is now one of the most popular tourist destinations in Europe. But just a few weeks before the Olympic torch was famously lit from a wheelchair, the people of Barcelona were already whooping with pride. At long, long last, their beloved football club had finally got its hands on the European Cup. Playing at the biggest stadium in Europe, Barça had always been one of the continental giants. But club football’s greatest accolade had always eluded them. Liverpool had been champions of Europe four times, Ajax and Bayern three times each. Celtic, PSV Eindhoven, Aston Villa, Red Star Belgrade and even Nottingham Forest (twice!) had won it, and what most pained culès, Real Madrid had won it six times (albeit in ‘black and white’). Fairs Cups and Cup Winners’ Cups were all well and good, but the Orejona (‘big ears’), as it’s affectionately known in Spain, was conspicuous by its absence. In contrast to the modern Champions League format, in those days the competition was only open to the winners of each national league. Unfortunately for Barça, in Spain that was almost always Real Madrid. 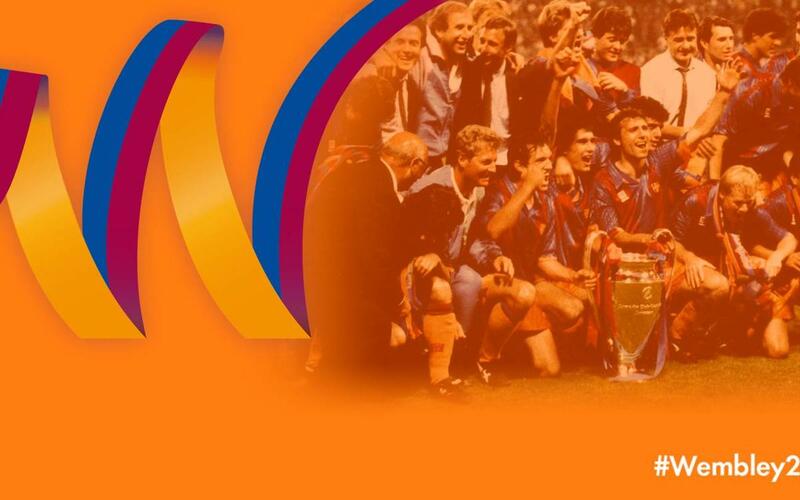 1991/92 was only the fifth time that Barça had even played in the European Cup. Their previous participation, 1985/86, was still fresh in the memory. Nobody had expected the blaugrana to lose the final to Steaua Bucharest. But a dour game in Seville ended 0-0, and the penalty shootout did the rest. Most of Barça’s millions of modern-day fans can be forgiven for not remembering the team’s 1991/92 campaign. Cable and satellite television, not to mention the internet, were still in their infancy, so outside of Spain there was next to no media coverage of the 3-1 aggregate defeat of Hansa Rostock (the last East German champion to feature in the competition) or of Jose Mari Bakero’s legendary last-minute goal to eliminate Kaiserslautern in the second round. For the first time ever, UEFA introduced a group stage to the competition, which a year later would be rebranded as the Champions League. Barça squeezed through in a group that also featured Sparta Prague, Benfica and Dynamo Kyiv to secure a place at Wembley, where the opposition would be Sampdoria of Italy. By 2017 standards, that might look like a relatively simple passage. But 1992 was a different era. In the days before the Bosman ruling, teams were limited to just three foreigners on the field at once. The booms of TV money, international shirt sales, multi-million sponsorship deals and the gentrification of football in the late nineties had yet to come. European football was a much leveller playing field back then, and the Serie A champions, with the likes of Pagliuca, Vialli, Mancini and Cerezo in the side, were a formidable rival in the early 90s. Penalties loom... and Koeman scores! And so to that marvellous 20 May 1992 in London. Thousands of fans had made the journey north, by land, sea or air. They were treated to a tense, if not particularly thrilling, ninety minutes of football. It ended with no score. The game went into extra time and was just eight minutes away from a potential penalty shootout when Ronald Koeman lined up the free kick that would change Barça forever. The rest, as they say, is history. The ball hit the back of the Wembley net – followed by that iconic image of the late, great Johan Cruyff joyously stumbling over the barrier as he raced to join the celebrations. He was the man who had masterminded the whole thing. The outpouring of emotion in Barcelona was extraordinary. Cars sounded their horns as flag-waving crowds flocked to Las Ramblas like never before. Being a Barça supporter had never felt better. ‘Big Ears’ had finally come to Catalonia. The decades of being bridesmaid but not the bride were over. Just two weeks later, the same scenes would be repeated when Barça swiped La Liga from Real Madrid's grasp on the very last day of the season. And what’s more … the Olympic Games were about to begin! It was the dawn of a new era. There has been so much success in the 25 years that have followed that it’s easy to forget just what that night meant to the long-suffering Barça supporters of the early nineties. But no matter what glory the later years have brought, with the passion for the club now transcending international boundaries, there may never be anything that quite compares with that wonderful summer of 1992. And that's why it's an occasion worth honouring. Enjoy the video. Enjoy Barça.